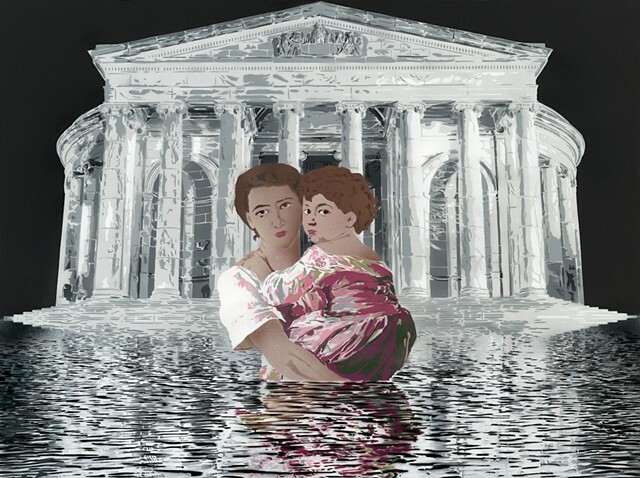 Rising Seas is the second painting in the Climate Change series. Numerous studies and forecasts have identified coastal areas, including large cities, at risk to tidal flows. Washington, D.C. is one such area. Were the sea level to rise three meters, a conservative forecast compared to many, most of the Jefferson Memorial Park and half of the walk-up to the Jefferson Memorial itself would be under water. As in the first climate change painting, figures from a William-Adolphe Bouguereau artwork were appropriated - Junes Bohemiennes (1879) - to remind all the choices we make now (or do not make) will affect our children.